Pause. Rewind. Where are the cliff-stomping, adrenaline-rushed athletes climbing into helicopters to seek fresh powder? The Ski-Dooing crazies and stunt junkies who thrive on freezing cold, howling winds and hurled snowballs? Oh, they’re here, all right. It’s just that they all happen to be women. Produced by Lynsey Dyer, an Idaho-based freeskier and cofounder of SheJumps.org, Pretty Faces is, like many ski movies, meant to get winter athletes stoked for the season. But it’s also about empowering women to get outside their comfort zones by getting outside — the mission of the nationwide SheJumps organization. That organization now has a foothold in the Green Mountains, with SheJumps-sponsored events happening from Manchester to Montpelier. 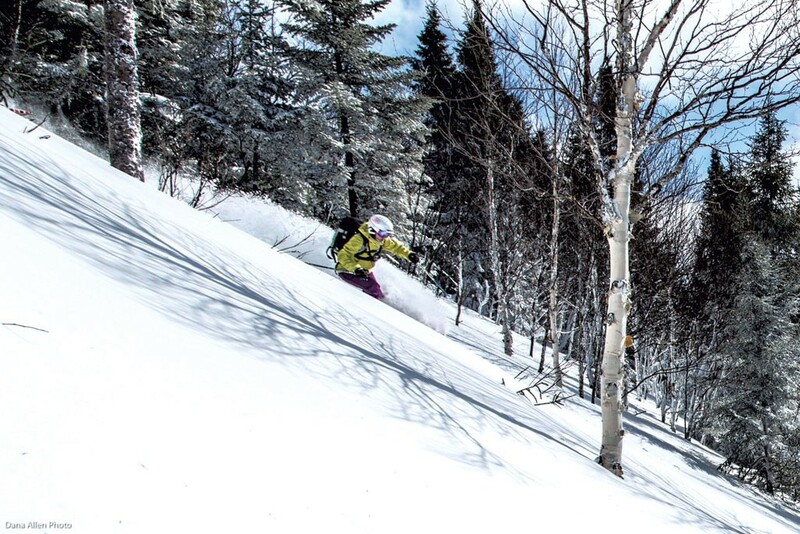 And one of the “skier girls” featured in Pretty Faces is Vermont’s own Louise Lintilhac, a former competitive freeskier who immediately jumped on board when she heard about the project. Lintilhac hadn’t personally met Dyer before participating in Pretty Faces; her husband, a sports photographer, facilitated her appearance in the movie by contributing footage. But the 30-year-old Waterbury resident — who has also appeared in ski movies from Williston-based Meathead Films — has been rehearsing for this role her entire life. Lintilhac was raised skiing at Stowe Mountain Resort, raced for Mt. Mansfield Winter Academy and attended Middlebury College. She skied in the Italian and French Alps for a season, then hightailed it to Crested Butte, Colo., where she discovered the big-mountain competition circuit — and stomped it. But the thrill of scaring the bejesus out of herself at the top of a near-vertical wall of snow soon settled into a deeper appreciation for the backcountry experience. The Rockies had plenty of their own pretty faces, luring Lintilhac into wide-open bowls of powder and steep, sinewy chutes. But when she moved back to Vermont to pursue graduate studies in environmental thought and culture, she says, she rediscovered the allure of the Green Mountains and Québec’s Gaspé Peninsula. “There’s something magical about the eastern woods,” says Lintilhac, whose sequences in the film were primarily shot in Stowe and the Chic-Choc Mountains. Lintilhac hopes to launch a SheJumps series of workshops to help women choose safe and comfortable backcountry equipment at Burlington’s Outdoor Gear Exchange, which will show Pretty Faces later this month. The film’s teaser is tantalizing, if more for the sights and sounds of women celebrating winter than for the quirky first few seconds. Who needs unicorns and rainbows when you have a film that shows off Green Mountain and Gaspé environs — for the good of girls and women, and protecting New England nature? The original print version of this article was headlined "Chick Flick"